New SuperDuo pattern: Athena Bracelet and Earrings. 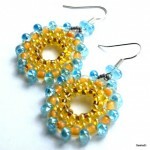 I just uploaded a new pattern to my website: the Athena Bracelet and Earrings, $5.00, also available at Bead-patterns.com: It uses size 11 seed beads, 4mm …. Download free beading pattern to make pretty earring Floweret. Everyone loves receiving jewelry as a gift, and when it’s handmade by a friend or loved one, it’s even better. Follow along with this video jewelry making guide to learn how to make a matching bracelet and earrings set that is delicate and beautiful…. Time and beads wait for no one.